For those of you not keeping track, there are plans afoot to vastly improve the first mile of the C&O Canal and Towpath that run through Georgetown. The project is in the ‘Develop Alternatives’ stage, and the NPS presented two concept options (Plan A and Plan B) for multiple distinct areas, including the Zero Mile Marker, the Rock Creek Confluence and the Aqueduct. It all looks pretty amazing, have a look at the concepts and plan for yourself (and see the meeting presentation). Review the plan and give your comments by May 11. You can let them know what is most exciting or what are the missed opportunities. Find the link to submit electronically here. 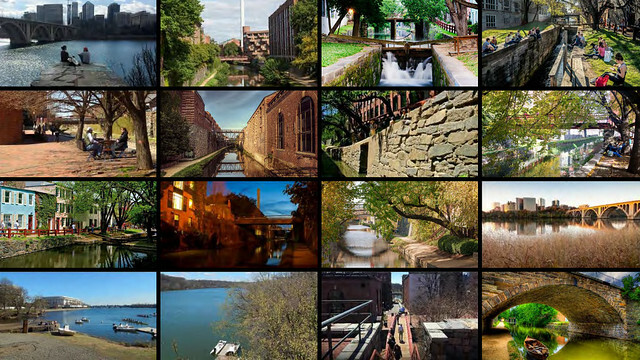 The plan will focus on addressing deferred maintenance issues and related safety and accessibility concerns associated with the towpath; improving connections between Georgetown and the C&O Canal towpath; enhancing visitor experience through increased signage and optimizing underutilized areas. 1. Respect, celebrate, and interpret the Canal’s historic character, authenticity, and sense of place. 2. Rehabilitate and reveal the Canal’s historic structures and cultural landscapes for the enjoyment and interpretation of current and future generations.